As is true every Easter season, the appointed Scripture lessons for Sundays include passages from Acts. 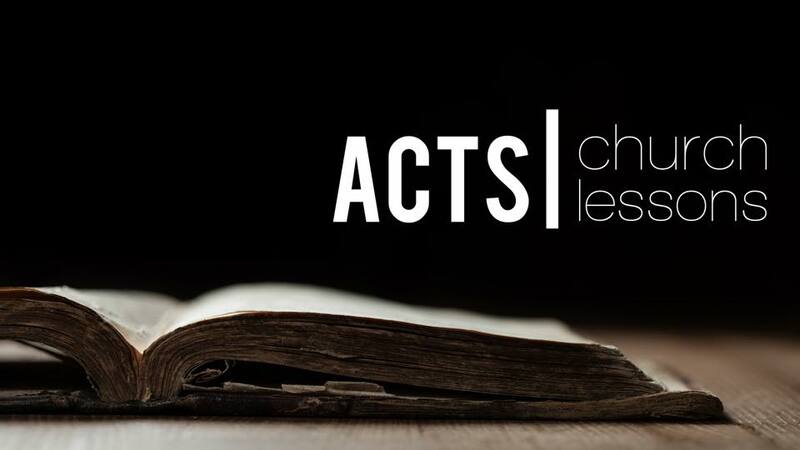 So today, we begin a new series of Sunday messages based on Acts that we’re calling Church Lessons. We start today with Acts 4:32-35. To dip into this amazing book four chapters in, it’s necessary for us to set the scene. In Acts 2, as 120 disciples were gathered in Jerusalem for prayer, the Holy Spirit descended on them and the Church was empowered to fulfill Jesus’ commission. By the power of the Spirit, they told the crowds from all over the Mediterranean who were gathered in Jerusalem for the Pentecost festival, in the diverse languages of those crowds, about God’s mighty works. Especially the mightiest act of all: God becoming human in Jesus, living a sinless life, dying on a cross for our sins, and rising from the dead to give forgiveness and new life to all who believe in Him. On that day, Peter then preached a sermon that brought 3000 people to faith in Christ. We’ll be celebrating Pentecost Sunday six weeks from now. After Pentecost, the Church continued to pursue its mission and ran into opposition for it. But instead of collapsing or falling to the temptation of returning violence or hatred to its persecutors, the Church, as well portrayed in the fantastic new movie, Paul: Apostle of Christ, prayed for boldness in lovingly sharing the good news, the gospel, of the crucified and risen Jesus with the world. It’s soon after this that we come to our passage for today. We need to spend some time talking about what these words mean and what they don’t mean. As we talked about a few Wednesday nights ago during Lent, the disciples in Christ’s Church did have conflicts and disagreement. They seem to have known the wisdom of the modern wag who said, “If two people agree on everything, at least one of them is irrelevant. To be of “one heart and mind” doesn’t mean that the first Christians always agreed with each other. They didn’t. Among the many disagreements and conflicts, the one most consequential to you and me, maybe, is the one that raged for some time over the ministry to Gentiles, non-Jews, by Paul. There were Jewish Christians who insisted that Gentiles couldn’t be grafted into the Church or the Kingdom of God. They were sure that only Jews could be Christians and that Paul was blaspheming God by welcoming non-Jews, Gentiles, into the fellowship of Christ’s Church. In Acts 15, we’re told about what’s now called the Council of Jerusalem. There, all points of view were aired and those gathered finally agreed to let Paul reach out to the Gentiles. As long as Gentile believers would respect Jewish Christians, Gentiles would be welcomed into the fellowship of Christ’s Church as fellow heirs of God’s grace given in Christ. That was a good decision for you and me, making it possible for us to know Jesus and the free gift of new life He gives to all who repent and believe in Him! There are some non-negotiables for people to be part of Christ’s Church, of course. The Church expects believers to accept the deity of Christ, the Holy Trinity, the belief that we are saved by God’s grace through our faith in Christ, the witness of God’s Word in the Bible. But the first Christian disciples, led by the witness of the apostles and the Holy Spirit, concluded agreement about unimportant matters like times of meeting, the kinds of songs, the color of the carpet, or whether people wear jeans or suits and ties to worship, to put it all in modern terms, was unnecessary. In other words, when you were part of God’s community, no one who is part of it should be in need. But Jesus has expanded the meaning of Jubilee. Through His once-and-for-all sacrifice of Himself on the cross, He has forgiven all of our debts and told His people that as we have been forgiven of our eternal debt to God, so we are to go about relieving our sisters and brothers in Christ of their debts to God, to us, to the world. "Forgive us our trespasses as we forgive those who trespass against us," Jesus teaches us to pray. So, the first Christians did something far harder than agreeing with each other: They took care of each other. When their widows or other destitutes among them, who had no Social Security, Medicare, or Medicaid to rely on, no 401k's or 403b's, were in need, their fellow Christians met those needs. To be the Church means, among other things, that we take care of each other. Many congregations have the attitude that the pastor is the hired caregiver. But that’s not the Bible’s vision of the Church. Acts tells us that the whole Church took care of the whole Church: in prayer, in ministering love, in shared burdens, and in money given in support. Years ago, I wanted to take a group of young people on a weekend during which they would worship with hundreds of other Christian young people, meet to study, pray, and reflect in small groups, hear great speakers with inspiring messages geared to them, and do service projects in Jesus’ name. One of the boys in our group wanted to go, but his mom, a single parent struggling to make ends meet, couldn’t afford the modest registration fee or the additional expenses for things like meals during the trip. I went to the Church Council and laid out the need. The council spent the better part of a half-hour going over the pros and cons. Money was not an issue; the congregation had the money. Council members were afraid of the precedent that might be set if they authorized the expenditure of a few hundred bucks for one kid to experience something that might change his life. They decided against paying for the young man’s registration. I was shaken. This was a truly great congregation, but its leaders couldn’t see their way clear to helping a fellow disciple in need. The meeting ended and I wondered what I was going to tell the mom. "I'm sorry, but the congregation doesn't care about your kid?" "I'm sorry. We can't afford to invest in your child's discipleship?" Things were lean for Ann and me: I was willing to help, but I didn’t have all the money needed. Besides, I felt that this was a responsibility of the whole community, to help grow the disciples in our fellowship. I knew that the man’s “source” would be his own bank account, though it was clear he wanted no credit for it. All I could do was thank him again and again. That man, still a friend of ours, was, in that small way, living out the Biblical vision for the Church: He saw the needs of another disciple in Christ’s Church as something he was called and enabled by God to take care of. Disciples in Christ’s Church live in the absolute certainty that as God has blessed them, they are set free to bless their fellow believers--and the world, strengthening our witness for Jesus. Notice that it was God’s grace at work among them powerfully that enabled the first Christians to take care of each other. Anyone who tries to do God’s will without an utter reliance on the grace--the charity--of God will fail. But when we let the gracious God we know in Jesus lead us, we can do anything that God is calling us to do, including taking care of one another in this community of faith, Living Water Lutheran Church, whether we agree on things like the color of the carpeting or whether men show up to worship in ties. A not-very-good nineteenth century hymn was called, God Will Take Care of You. It has an atrocious sing-song melody. It's awful; I love it! It's message is right on point: The God we follow through Jesus Christ is committed to providing us with our daily bread. He will and He does take care of us. But sometimes a Christian sister's or brother’s bread will be sent to them from God through those of us who, at the time, have more bread than we need. Jesus says that the world will know that we belong to Him when we love each other (John 13:35). Acts shows us that loving one another isn’t about an attitude of friendliness. If, in response to God's grace, we set out to love others as Christ has loved us, there will always be a price tag attached, whether it’s in the sacrifice of convenience, time, status, money, sometimes our very lives. When we make sacrifices to take care of each other, we give witness that we can live in utter reliance on Him because Christ is alive and the gospel is true. The risen Christ assures that no matter how much we give of ourselves, He gives us eternity and more. Christ gives Himself to those who give themselves to Him. So, we are called to take care of each other. Church lesson #1: In all ways, we are to seek and are set free to seek to take care of the needs of our fellow believers so that together, we can be authentic witnesses for the new life God is establishing in all who confess that Jesus Christ is Lord.